Last week, cold and snow hit my house, which meant it was time for some soup. I know this is a pretty basic item, but I’m kind of skeptical of chicken noodle soups. I like the one my mom made growing up, but she just used a mix where you add water and chicken. I feel like I should be able to make something just as good homemade, which hasn’t been as easy as I thought. I have a recipe from the Food Network Magazine I have made a couple times, and it was ok. I remember seeing a recipe on smitten kitchen that intrigued me. This time, I decided to combine the two, and the results were great. I’m excited to eat my leftovers of this tonight. 2. Add water, bay leaves, 2 teaspoons salt, and 1 teaspoon black pepper. Scrap up bits from bottom of pan when you add the water. Bring to a boil. Reduce to a simmer and cook, partially covered, for 20-30 minutes. Skim off any scum that surfaces as needed. 3. Strain broth, saving chicken parts. Pour broth into large bowl/pot. Skim any fat off of broth as needed. When cool enough to handle, shred or chop meat into bite sized pieces. 4. Add butter to empty stock pot. When melted, add diced onions. When onions begin to soften, add flour and cook, stirring constantly, for 30 seconds. Gradually add broth, stirring constantly. Add parsnips and carrots. Bring to a boil and cook for 5 minutes. Add egg noodles and cook according to package directions. Two minutes before noodles will be done, add green beans, zucchini, and chicken pieces. Cook until heated through. Season with lemon juice, salt, and pepper as needed. Recipe Notes: I used 1 chicken breast and the bones from a leftover chicken (which I had picked pretty clean when we ate it). If you have “meaty” bones, you don’t need the extra chicken breast. If you don’t have leftover chicken (or turkey) bones, you can just use chicken pieces. If that is the case, I would recommend mixing legs and bone-in breasts; this gives a mix of white and dark meat with bones to keep the meat more flavorful. When I roast my chicken, I roast it with a lemon in the cavity. This added a nice, subtle lemony flavor to my broth. Since you may not have done that, I added the lemon in the broth stage in the recipe. You can also add some lemon juice later, if it needs it. As always, feel free to mix and match whatever vegetables you like in the soup. If you prefer a different noodle, also feel free to substitute. For the nutrient analysis, I used 8 cups of chicken broth and 3 cups of chicken. Low iodine adjustment: Use non-iodized salt. 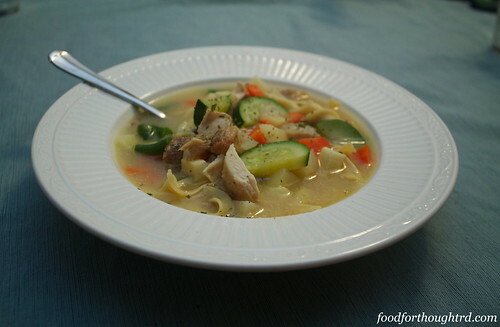 Substitute regular noodles made without salt for egg noodles. Kim, I just made this for lunch. I’ll be honest and admit that I cheated and bought the chicken stock, and I also added celery, but otherwise I followed the recipe. Delicious! I loved the parsnips–I hadn’t ever put those in chicken noodle soup before. Greg – totally ok to use store bought chicken stock. I have done the same. I mostly just liked this method for relatively quick chicken broth where you don’t throw away a bunch of meat. I love your addition of celery! Thanks!